Sketch assignment for Berg municipality 2011. Commissioned art work for Berg municipality supported by the 1 %-rule that are used for reconstruction of older communal houses for new communal use to become a child care centre. The budget for this work was only 20000 SEK ex VAT (3055 CAD), but alot of the mounting and after work was not included in the budget. I did way to much for that sum, but that was a choice of my own. The work was completed 2013. Sintered stoneware ceramics, with engobes and glazes. Mounted by tilers on a minerit board with proper fixing for tough winter conditions. The twentyone owls are made in natural size (1:1) as the are in nature and have the same hand made glass eyes that are used by bird taxidermists to give a very realistic impression. Communal child care centre, village of Rätan, Berg municipality, Sweden. Every child that starts preschool and every grown up working there is unique, but some of them may look a bit alike each other in size or ways of behavior and style. That's also a fact for owls. 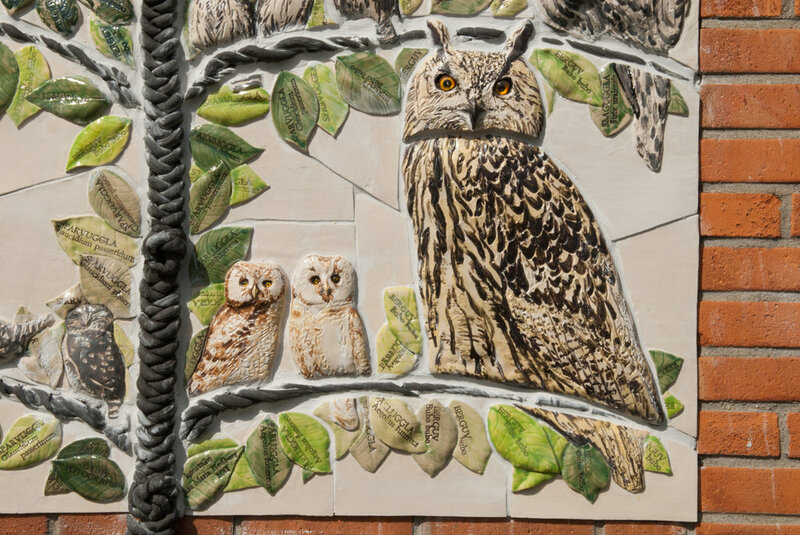 In this stylized paradise tree these nine species of owls, that all of them might fly by or even breed in the area of Rätan, have joined for a group photography. The smaller ones peeps at and admires the the larger wise and safe ones. At the leaves surrounding each owl the care taking grown up peadagogs can read the name of the closest species in both Swedish and Latin and tell the curious kiddies who can not yet read for them selves.